Young super hero-in-training will team up with Charlie T. RiverDog to stop "The Joker"
CHARLESTON, SC - The Charleston RiverDogs are prepared to open a seven-game homestand at Joseph P. Riley, Jr. Park tonight, but an evil force is lurking in the shadows. The Joker has escaped from Gotham City and has taken refuge in The Joe. Charlie T. RiverDog needs to foil The Joker's diabolical plans, and he is turning to a young fan to help him save the day. Ten-year old Kayla Helferich of Summerville will be "Batgirl" and join Charlie, Charleston's lovable "Caped Canine," for Super Hero Night as the RiverDogs host the Augusta GreenJackets at 7:05 pm on Tuesday. 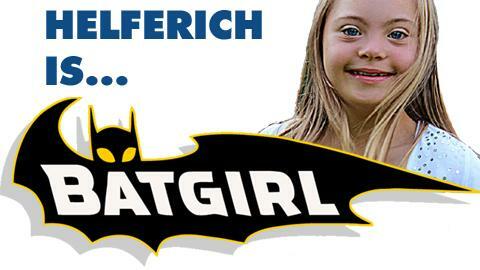 Helferich has Down syndrome and also won the 2011 Prevent Blindness America "Most Beautiful Eyes" contest, but now she starts her quest to become a real super hero. Batgirl will train as Charlie's sidekick and help him keep order throughout the ballpark while they look to apprehend The Joker. She must receive and solve clues to The Joker's location that will be provided by The Riddler, another Batman archenemy from Gothan City. She is also scheduled to perform various "civic duties" around The Joe as a part of her training, which might include an inning as an aptly-named "bat girl." First pitch for tonight's homestand opener is set for 7:05 pm with RiverDogs RHP Brady Lail (2-1, 5.49 ERA) pitching against GreenJackets RHP Chase Johnson (1-1, 2.08 ERA). Harris Teeter 2-for-$20 Date Night Tuesday, presented by Nash FM 96.9, offers a great deal for couples that show their VIC Card at the box office. The Date Night package includes two tickets to tonight's game, two tacos, two fountain drinks, and one nacho tray for just $20. Tickets may be purchased at the Riley Park Box Office, (843) 577-DOGS (3647) or on-line at www.riverdogs.com. If fans cannot make it to the ballpark, they are encouraged to tune in to all the action this year both home and away worldwide on www.riverdogs.com and locally on 1250 WTMA, the new radio home for RiverDogs baseball.